Time Cave. A heavily-branching sequence. All choices are of roughly equal significance; there is little or no re-merging, and therefore no need for state-tracking. There are many, many endings. Branch and Bottleneck. The game branches, but the branches regularly rejoin, usually around events that are common to all versions of the story. To avoid obliterating the effect of past choices, branch-and-bottleneck structures almost always rely on heavy use of state-tracking (if a game doesn’t do this, chances are you are dealing with a gauntlet). Quest. The quest structure forms distinct branches, though they tend to rejoin to reach a relatively small number of winning endings (often only one). The elements of these branches have a modular structure: small, tightly-grouped clusters of nodes allowing many ways to approach a single situation, with lots of interconnection within each cluster and relatively little outside it. Re-merging is fairly common; backtracking rather less so. Quests generally involve some level of state-tracking, and do poorly when they don’t. The minimal size for a quest is relatively large, and this category includes some of the largest CYOAs. Open Map. Even though quests are structured by geography, time still plays an important part: there’s a built-in direction of travel. But take a CYOA structure, make travel between the major nodes reversible, and you have a static geography, a world in which the player can toodle about indefinitely. Often this is a literal geography and relies on extensive state-tracking both explicit and secret for narrative progress. But it’s not an uncommon mode for things with assumptions grounded in the hypertext-novel idiom – static but non-linear works like Le Reprobateur. Sorting Hat. 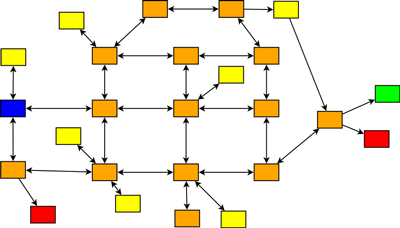 The early game branches heavily and rejoins heavily (branch-and-bottleneck is a likely model here), ultimately determining which major branch the player gets assigned to. These major branches are typically quite linear – sometimes they look like gauntlets, but they might be choiceless straight-shots. Sorting Hats almost always rely substantially on state-tracking in the early game, and often bottleneck at the decision point. Floating Modules. A mode only really possible in computer-based works. There is no tree – or, while there may be scattered twigs and branches, there’s no trunk. No central plot, no through-line: modular encounters become available to the player based largely on state, or perhaps randomly. There are different approaches to floating-module: Emily Short has a tentative categorisation here. Loop and Grow. 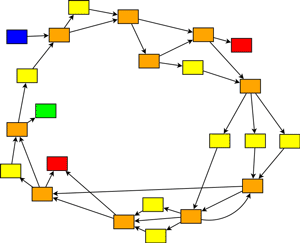 The game has a central thread of some kind, which loops around, over and over, to the same point: but thanks to state-tracking, each time around new options may be unlocked and others closed off. This is a very general pattern, and can co-exist with many others. Trapped in Time, for instance, is basically a cycle-and-growing Gauntlet; Bee tames its floating-module nature with a year-long loop structure. This entry was posted in cyoa, interactive fiction and tagged choice of games, Failbetter, structure. Bookmark the permalink. King of Chicago divides its content up into 230 modulee, each of which is a small choice graph. Each module has several target state variables and values as preconditions, and it chooses which module to used based on a least-squares fit of the target variables. However, it’s not actually choosing from all 230; the modules are also divided up amongst several subplots, which are processed independently. (If I understand correctly, only one subplot has choices, and the other subplot are cutaway scenes to show what other people are doing). And there must be some other thing as well, because he says it’s usually only choosing from 10-20 modules at a time. Yeah, I’m really pretty curious about the approach – how many modules would you need to avoid the least-square fit being overdetermined? Now I have urges to tinker with things. I bet Floating Modules could be done with any form of randomness. I seem to recall some crunchy gamebooks with random encounters determined by dice roll. I can kind of imagine a big card-catalogue kind of thing with a complicated code system on the tabs, yeah. Horrible to implement as a book, but I shouldn’t underestimate the lengths people will go to in order to implement fiddly programs as paper gamebooks. With most of our games we use the branch and bottleneck paradigm. It’s not unintentional. It’s a conscious choice to maximize the apparent player choice while still limiting the work to be done in handling branches. It also allows us to tell a story where we get to control the major beats, i.e. bottlenecks. In the cases where there are multiple endings, it is usually like you drew it, as the final choice. Thoughts on the structure of adventures, this is important to have in the back of the mind when you asseble a RPG session. And also a souce of inspiration. 1998’s “Patterns of Hypertext” lists some of these and many other patterns that you may find interesting. It’s really neat how authors discover and re-discover and re-invent patterns, a little different each generation. There are no Magic Sneakers and no Prince of Kaldorn in this book. You have been cheating. Vindictus, the Patron of Decision Novels, appears. Reaching out of the book, he casts a spell on you, and you turn into an unbelievably ugly toad. Your score is negative fifty million billion zillion points. The score for the best ending probably isn’t important to a cheater like you who probably looks at the last page first. Getting to know the IF community better. This is an excellent post. Pingback: My Name is Tara Sue | what will you do now? Reblogged this on Ulm Tales.